This is a glossary of real terms related to biology and space travel, and anything else that might need defining. For terms specific to life on Ilion, see Life and Biomes. Autoclave – a device for sterilizing equipment using superheated steam under pressure. Autoclaves come in sizes ranging from stovetop pressure cookers to walk-in closets. The autoclaves brought to Ilion were on the smaller end of the scale. Biosecurity/biosafety – Biosafety refers to practices designed to prevent cross-contamination of biological systems. This can be anything from germs to invasive species, keeping the inside in and the outside out. 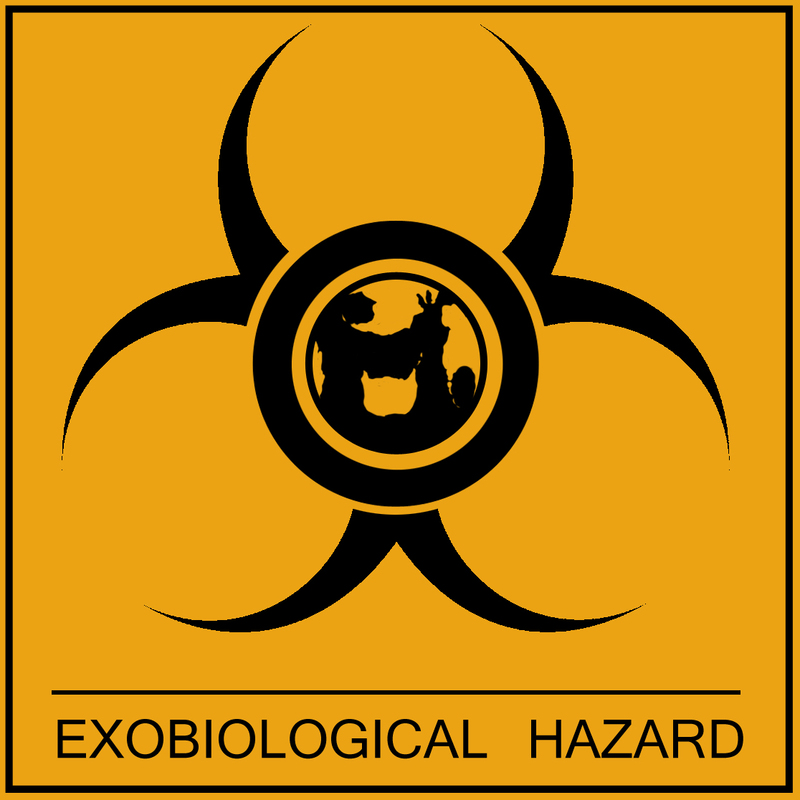 Biosecurity is specific to diseases, pests, and bioweapons. The terms are sometimes used interchangeably. A symbol to mark biological specimens from Ilion and any items that may have been exposed. Although not known to be dangerous, samples from the exoplanet and contaminated items are treated like BSL-3 agents. Biosphere – the ecosystem of ecosystems. The sum of all life on the planet. Clade – A clade is a branch on the tree of life. Kingdom, phylum, class, genus, species, etc. are all types of clades. I avoid using these terms for fictional life because there are no universal rules distinguishing one from another. Whether a group is called a superfamily or a suborder is arbitrary, so they are all just clades here. Epiphyte – a plant that grows nonparisitically on another plant. Eusocial – a high level of organization within a species characterized by reproductive division of labor (a queen, king or drones, and sterile workers) and overlapping adult generations. Think bees and ants. Superorganismhood is a type of eusociality that is exceptionally organized. Evolutionary grade – A grade is a group of organisms united by a common trait, that is not a clade. Often, a grade will be a clade with a branch excluded, such as reptiles (amniotes that aren’t birds or mammals), lizards (squamates that aren’t snakes), and bryophytes (nonvascular plants). Grades are sometimes denoted with quotation marks – “lizards” are a grade; squamates are a clade. Exobiology (astrobiology, xenobiology) – the study of life outside of Earth. Exobiology and xenobiology are exclusively about alien life, while astrobiology also includes Earth organisms living offworld. Extraoral digestion – treatment of food with digestive enzymes prior to eating, a strategy commonly employed by liquivores that take solid prey. Houseflies are a familiar example; that’s why they spit on their food before lapping it up. Gnotobiotic – an animal that is free of all but a few known microorganisms, or entirely germ free. In the lab environment, gnotobiotic animals are born germ-free into sterile conditions and then treated with either a cocktail of commensal microorganisms, or a disease agent (such as salmonella) for research purposes. Gnotobiotic pigs and mice are also useful for producing clean animals from “dirty” stock through embryo transfer or fostering, for use in research and agriculture. Gnotobiosis was used to minimize the transfer of Terrestrial microorganisms to Ilion’s biosphere, at least in theory. In actuality, the method used to make the Odyssey I astronauts germ-free was imperfect. The germs that survived the process were resistant to antibiotics and disinfectants, leading to contamination of the outside environment and a particularly nasty infection in one of the astronauts. Gnotobiosis was not attempted in subsequent missions. Gut – Here, gut refers to the entire gastrointestal tract, not just the intestine. Liquivore – Liquivores are animals that digest their food before they eat it. An example on Earth would be spiders, which inject their prey with enzymes and drink the resulting sludge. I also use the term to describe blood sucking organisms even if they only minimally preprocess their food. Obligate vs. facultative – An organism’s behavior or diet can be obligate or facultative, meaning required or not required. For instance, cats are obligate carnivores because they cannot survive without meat. A facultative parasite can survive without a host; an obligate parasite cannot. Microgravity (zero g, free fall, weightlessness) – the absence or near absence of forces due to acceleration (acceleration refers to any change in speed or direction). Astronauts will experience weightlessness while orbiting a planet (so that their acceleration cancels out the force of gravity), or while drifting through space under no thrust. Thrust and spinning are two ways to simulate gravity on a trip through deep space, providing a constant force that keeps everyone’s feet on the ground. 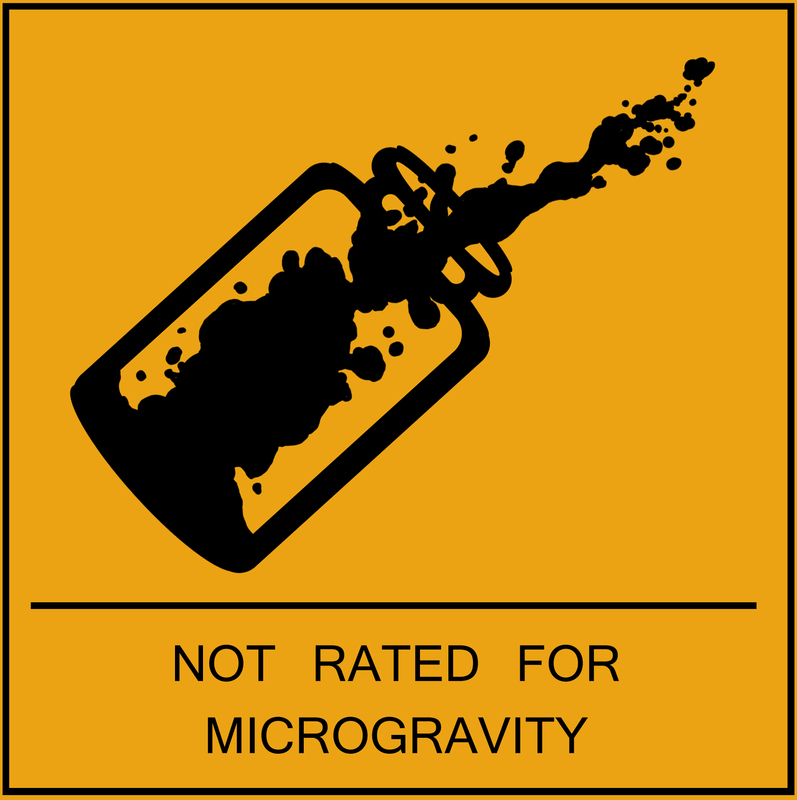 A symbol to mark equipment that is not intended for use in microgravity. Ploidy – the number of each type of chromosome that an organism has in each cell. A haploid organism has one of each chromosome (n), while a diploid organism has two (2n). A single species can be both at different stages of its lifecycle. For example, mosses are haploid except for their spore producing stalks, which are diploid. This is called alternation of generations and is very important to both life on Earth and Ilion (and also very interesting!). Although genetics works differently on Ilion, the terms haploid and diploid will be used for simplicity’s sake. r/K selection theory – In short, r/K selection theory describes reproductive strategies based on quality and quantity of offspring. An r-strategist opts for large numbers of offspring, most of which will not survive to adulthood. A K-strategist opts for few hardy offspring instead. The theory is outdated and simplistic, but still useful as a shorthand when describing textbook cases, like spawning fish (r) and elephants (K). Rostrum – literally, a beak; a rostrum can also refer to any protruding structure of the nose or mouth, such as a proboscis. Selection (natural, sexual, or artificial) – Selection is the factor that determines which genes survive into the next generation. Over time, selection leads to evolution and speciation. Selection can be natural, sexual, or artifical. Natural selection is about who gets to survive and sexual selection is about who gets to mate. Artifical selection is directed by humans, who breed plants and animals for certain desirable traits. Spaceship and mission nomenclature – Ships are in italics. Mission names and programs are not. So, Odyssey is a ship that went to Ilion. Odyssey is also a ship that went to the moon. Apollo and Odyssey are multi-mission space programs. No italics. Odyssey II is a mission, no italics. Apollo 13, same. Apollo 13 is a movie starring Tom Hanks. Confused yet? Symbiosis – An evolved association between two or more species. There are three types of symbiosis. Parasitism is when one species benefits from a host at the host’s expense. Commensalism is when the species benefits at no cost to the host. Mutualism is when both species benefit from the interaction. terrestrial vs. Terrestrial – Lowercase “terrestrial” means living on land, while uppercase “Terrestrial” means “from Earth.” A terrestrial planet is a rocky planet like Earth or Mars, as opposed to a gas giant or water world. Tidal locking – When a planet or moon orbits a much larger body, sometimes it falls into an orbit such that one side always faces the thing it’s orbiting. This happens because the satellite is not completely symmetrical; its weight is unevenly distributed and the heavier side is always pulled a little harder by its partner’s gravity. This is why the Moon has a near side and a far side, and why it’s always sunny in Philadelphia Pandaros.